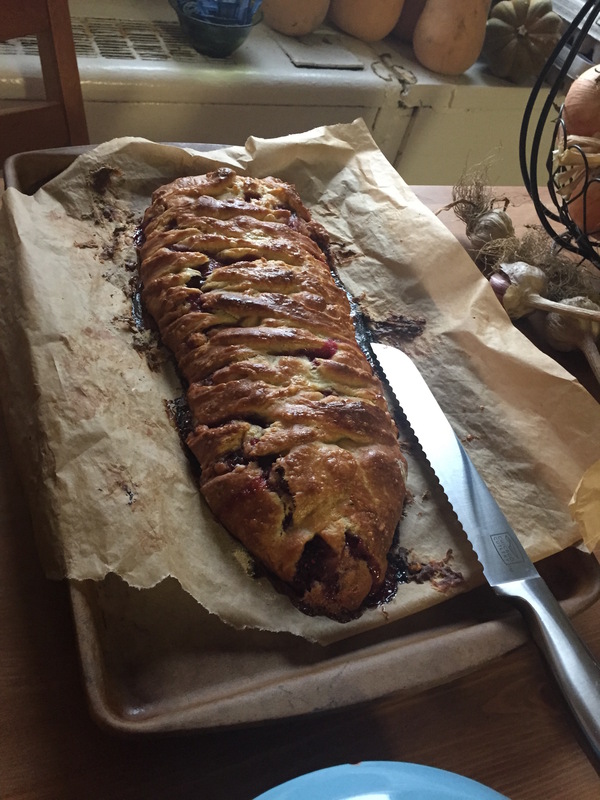 Okay, this is the final of my birthday posts (yeah, I may have overdone it a bit) and the first time I’ve shared a complete recipe on this blog! I’ve shared before that I’m fructose intolerant so many recipes that I make are altered to keep me from getting a tummy ache. The braid recipe was altered quite a bit so I wanted to share my version here. Let’s start with the jam. I love fruit, unfortunately most fruit gives me a stomach ache. Solution: make my own jam. I use glucose sugar instead of regular old table sugar to help counteract the fructose in the fruit and it’s great. One of the best things I’ve learned to do on this journey. 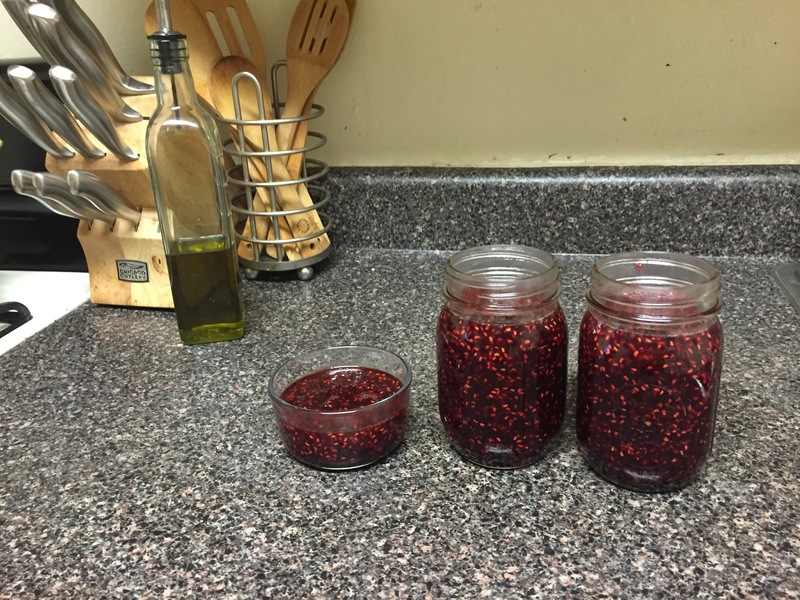 I often have a jam making day during the summer when berries are in season (though I learned this year that I really don’t like blueberry jam…waaaaaay too sweet). Warm 2 cups of glucose and 2 cups of sugar (I used turbinado sugar) in the oven at 250 for about 15 minutes. After 15 minutes, my raspberries weren’t ready so I turned the oven off and left the sugar in there. Smash 4 cups of raspberries over high heat on the stove. Bring to a boil for about one minute. Add the sugar. It really is amazing how quickly it all dissolved! Return to a strong boil until it gets sorta of gel-y. This actually took me closer to 10 minutes than 5 minutes. That little guy on the end is for the pastry! Cream together 4 Tbsp room-temp butter, 1/2 cup almond paste, 1/4 all purpose flour, 1 large egg, 1/4 teaspoon almond extract (I used vanilla because I didn’t have almond like I thought). I just threw all these things in the food processor and voila! So easy. The recipe also includes the option of adding 1/4 tsp of orange-flour water. Make the bread. One of my favorite things about Artisan Bread in Five is that almost everything can be done ahead of time. The dough just takes a few minutes to mix up, let it rise a couple hours and then you can throw it in the fridge until you’re ready to bake. I also like that the recipes are all BIG but can easily be doubled or halved. I made half of the brioche recipe for this braid (the authors recommend using either the brioche or the challah). The only thing I altered for the brioche is the honey. I can’t have honey. Eating honey is pretty much a guaranteed several day long stomach ache for me. I had a hard time coming up with a substitute here. I’ve used golden syrup in the past but it has a pretty strong flavor and I didn’t think it would be right for this recipe (plus, it’s sort of expensive) and many of the other suggestions online are also very fructose heavy (agave, maple syrup, even apple sauce). Eventually I settled on making a sugar syrup by melting equal parts water and sugar (the same turbinado sugar I used in the jam). Mix 1/2 tablespoon yeast, 1/2 tablespoon salt, 4 lightly beaten large eggs, 1/4 sugar syrup, 3/4 cup melted butter in a big bowl. Mix in 3 3/4 cups all purpose flour. Don’t knead! Cover (not airtight) for 2 hours. Refrigerate overnight (or a few hours up to a week!). Roll out some parchment paper (or grease a cookie sheet/baking stone). Generously flour whatever surface you’re using. Use half of the brioche dough and roll out a rectangle about 1/8 inch thick. You’ll probably need to add more flour so it doesn’t stick! 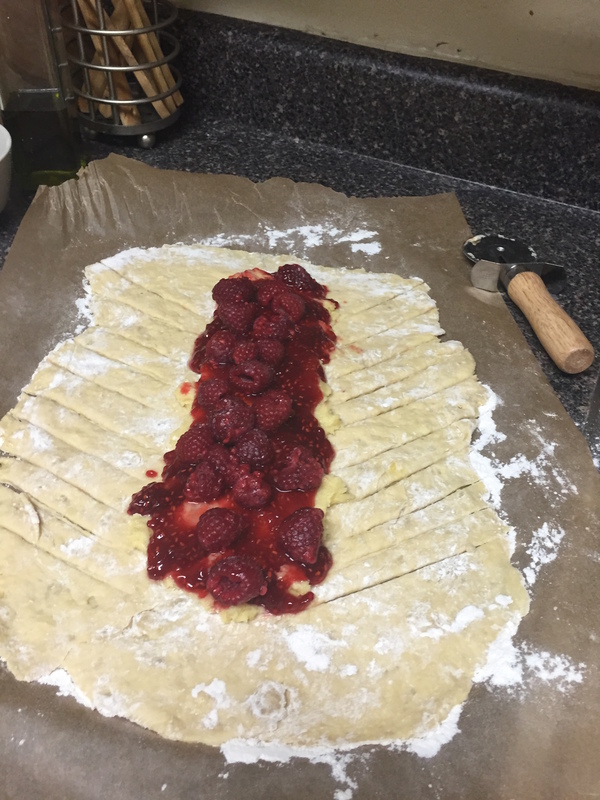 Put the almond cream, jam, and some more raspberries on the center third of the rectangle. Use a pizza cutter to cut slices about half an inch wide on either side of the jam, then “braid” them over the center. This is where the recipe says to let this rest for about 40 minutes and to preheat the oven to 350. This is where I put the braid in the fridge and went to the gym. When I returned, I took it from the fridge and turned the oven on. Brush the top of the pastry with an egg wash (one beaten egg with about a tablespoon of water). Impress everyone with your awesome pastry making skills. The fun thing about this recipe is that you could use whatever you are in the mood for as filling. The book has a savory idea, but I’m imagining cream cheese and strawberries next time or something like that. Yummmm…now I’m getting hungry again.